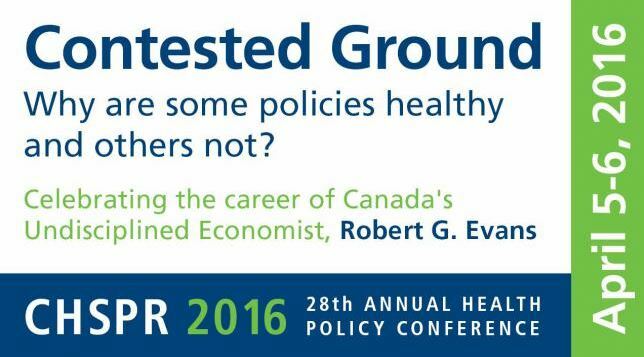 The UBC Centre for Health Services and Policy Research’s twenty-eighth annual health policy conference will celebrate the career of Canada’s Undisciplined Economist, and our very own, Robert G. Evans. We are excited about our amazing line up of speakers. Why is it so difficult to improve our health care system? Good policy ideas abound. Unfortunately all such ideas create winners and losers, such that health care policy is always intensely “Contested Ground”. Potential losers are frequently in a position to block or subvert progress because those who stand to lose are concentrated and strategically placed, while the beneficiaries are diffuse and disorganized. This conference will explore why some policies are “healthy” and others not. Some survive the contest, while others, although potentially also contributing to a more effective and efficient health care system, and/or improving a population’s health, don’t. Still others, with well-understood unhealthy effects, thrive like weeds. Bob Evans has spent his career exposing “inconvenient truths” about the impacts of interests, positions, and policies in the health realm. The conference, intended to celebrate the vision, contributions and impacts of that body of work, will feature speakers addressing some of Bob’s most visible lifetime preoccupations. Conference themes will include international perspectives on contemporary Canadian health policy challenges, health care financing, other current health policy issues such as legal challenges, and the role of broader health determinants. Learn more about Bob Evans and the Robert G. Evans Legacy Fund.